I have to admit to feeling slightly groggy this morning. The wine last night probably didn't help... but Thursday nights are for going out for dinner not watching football on Channel 5 - not that our friends down the road would know. Even though we've qualified, Arsene Wenger still wants us to go out and win in Greece in our final group game. The match against Olympiakos in my opinion is the perfect opportunity to blood some youngsters and give some of our battle hardened first team players the night off. But the manager - publicly anyway - is saying we will go with a team who want to win and we will respect the competition. 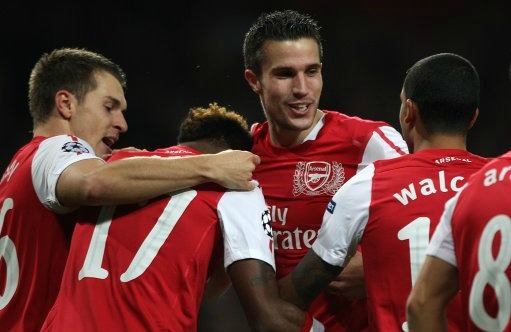 You've got to expect that Robin van Persie will be given the night off, along with Wojciech Szczesny, Laurent Koscielny, Alex Song, Gervinho and Theo Walcott. Especially if we've going to have to spend an extra night in Greece because of strikes. There is talk today of the manager mapping out a list of fixtures he'll try to leave van Persie out of. Personally I don't think we can be that clinical about it. I think the situation should be assessed on a week by week basis. Who knows who will be fit or injured in a month. You've also got to think about the form of the opposition. We can't decide a month away from a fixture that van Persie won't play. There might be an ideal scenario that the manager might wish for, but I think ideally he'd assess the situation game by game. We cannot afford to lose the Dutchman to injury. But we cannot afford to leave him out of the team at the moment. Personally I'd rather he started the game, get us to a winning position and then be substituted. None of this bring him on after 60 minutes and try and win us the game. There is continued reaction from Wednesday's Champions League win. Alex Song - fresh from one of his best performances in an Arsenal shirt this season - gave the media his views on the turn around we've achieved since September. "We started really badly, but it is not easy when you have new players - you need to give them time. "Everyone tries to help each other and we have very good cohesion, which is important. "When you play for a team like Arsenal you just want to finish all the time at the top of the league. That is what we try to do." I think with the experience we've brought in, the run of fixtures and the way we've strung some wins together has taken the pressure off. The team spirit is a lot better than it was at the start of the season. Mikel Arteta has started slowly, but is showing us all what a valuable player he is to us now. The manager has rightly been praising the Spaniard, who alongside Song in the middle of the park has been vital to our resurgence. The statistic produced last season by Orbinho about the importance of Song to our team's chances of winning was staggering. He is vital to the way we play and now that he has Arteta alongside him who is probably more defensively disciplined than Jack Wilshere is in the role, it allows the Cameroon international a bit more licence to roam forward. If Lionel Messi or Ronaldo had created Robin van Persie's opening goal against Dortmund on Wednesday night we wouldn't hear the end of it. But as it's an unfashionable player like Song, nothing more will get said about the brilliance of it. Personally I prefer the more defensive Song rather than the attacking Songinho. But when you're 2-0 up, I don't mind him curling one into the top right hand corner. "I think he will die with Arsenal. He is the same as Ferguson at Manchester United or Guy Roux at Auxerre. He will stay with Arsenal, that is my opinion, because Arsenal need him and he needs Arsenal. C’est l’amour." Pires gives some insight into the situation at the club, which is interesting but not new. How about Henry and Pires return in January? Now, wouldn't that be something. There's a few pieces of transfer tittle-tattle around. The Sun report Lille are after £43m for Eden Hazard when the player is sold in the summer. Whilst Dortmund director of sport Michael Zorc has said he believes that "wunderkid" Mario Goetze will still be at the German club next season. The latest Inside The Formation post was published earlier this morning and covers Aaron Ramsey's role in Wednesday night's win over Borussia Dortmund. Arsene Wenger will speak to the media later ahead of tomorrow's game with Fulham. The early team news is good. There are no fresh injuries and Abou Diaby didn't have a reaction to playing his cameo role - all six minutes of it. I'd expect the Frenchman to get some more minutes at the weekend and possibly a start in the Carling Cup. It will be interesting to see how seriously the manager is going to take the league cup because of the opposition. I know we don't expect a full strength team to play, but losing the game could be bad for moral and momentum. Personally I would have the strongest team possible with the option of playing Robin van Persie from the bench. We've seen before how fragile we've been following defeat - although this isn't last season's team. But I still would rather the manager went out with a team which was strong enough to win the game. Anyway, I'm getting ahead of myself. We've still got an extremely important game against Fulham to play tomorrow. Winning that is our first priority, then we can think about the Carling Cup game.